Tuscany's adults' pleasures are obvious: delicious food, expensive wines and some sophisticated art as a side dish. But what about the kids? Uncontaminated nature, fun sculpture parks, great beaches and plenty of medieval cities full of chiseled beast and scary doorknobs should do the job. Buonconvento, Paganico and Castiglione della Pescaia are some of my Southern Tuscan favorites for combining Renaissance art or Tuscan history with ice-cream stops. Feeling your kids are becoming too book smart with all the new-found Renaissance knowledge? Take them to one of the Water Parks on the coast near Follonica or Cecina. Endless up and downs will stop them talking Michelangelo & co. for a while. Preferably from Monday to Friday, as the water slides get packed on the weekends. But why even bother with water parks if you have Tuscany's beaches nearby? The kids won't miss the slides any longer once they've put foot on Alberese beach in the Maremma National Park. No need for a brolly, just bring a few sarongs and a bit of string - and get your youngsters to turn the drift wood on the beach into a hut or shady tent. 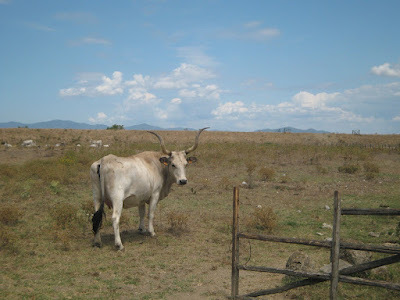 The best way to get there is via the well kept National Park cycling path, whilst admiring Maremma cows, foxes and sometimes even families of wild bores. Another fantastic beach to hang out as a family is Fiumara beach between Marina di Grosseto and Castiglione della Pescaia. You never thought eating out with kids can be fun? Me neither until our first dinner at Fiumara Beach restaurant - after a quick bite the kids can play in the sand whilst the parents try not to get too drunk during their contemplation of the perfect sunset. More details under my Fiumara Beach post. As with the water parks it's not like you'll be on your own during the week, but during high-season Saturdays and Sundays get much more crowded with all the people from Siena, Florence and any other hot Tuscan town joining in the fun. Too cold for water parks and beaches? 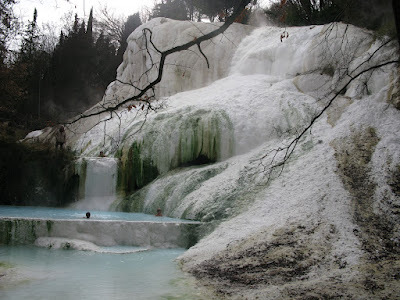 Check out Southern Tuscany's wonderful thermal baths. Great fun with kids are the Petriolo natural springs (30km south of Siena). Don't go to the fancy hotel up on the main road, but do the wild thing down in the valley - the kids will love it! And if granny is travelling along she can use the new Petriolo Spa right next to the free outdoor ones. Another favorite of ours are the San Filippo natural springs in the Val d'Orcia. A variation of the same theme are Bagno Vignoni (20 min from Montalcino) and Saturnia (1h from Grosseto and 30min from stunning Pitigliano). No need to reiterate things somebody has put out there already. Find more kids in Tuscany advice from superb Brunello wine bloggess Laura. As a mother of three she's an expert in regard to extreme tree climbing or goat petting in Tuscany. Click through to read her "Keeping Kids Happy under the Tuscan Sun" - posts: Part One and Part Two. If you're planning to hit Tuscany's cities, read my Kids in Florence and Kids in Siena guides, packed with tips and ideas for the whole family. Another good resource for things to do in Southern Tuscany is Terre di Siena, the official website of Siena's tourism office. Some of its content is only in Italian but you should get by with google translate. If you want to learn more about Tuscan history and the Medici, browse the Palazzo Vecchio Family Museum website, which provides plenty of insight into the Renaissance for young and old alike. Some of its video content may even be fun for the kids to watch before coming out.